In the increasingly competitive print market where return on investment really matters, humidity control is essential to maintain quality and productivity at all stages of production. Paper is very hygroscopic, which means it loses moisture rapidly when exposed to dry air. Sheet and web roll paper is typically produced and wrapped to stay in equilibrium with air with a relative humidity of 50±5%RH. When the ambient humidity falls below this level, paper loses water to the environment from exposed surfaces, changing its shape, dimensions and physical properties. Below 40%RH, the movement of paper on paper and other surfaces generates electrostatic charges, attracting dust and making it difficult to handle. The problems are most pronounced in hot summers and cold winters, when the relative humidity can fall below 20%RH even in temperate climates. Where water-based inks are used, a higher relative humidity of 55±5%RH is typically recommended, and some ink manufacturers recommend 60%. When the protective film or paper is removed from plates, electrostatic charge is generated if the relative humidity drops below a threshold of 40%RH. This attracts dust and grit to an otherwise unblemished surface, makes handling difficult and also generates sparks. Maintaining an environment of 45%RH prevents this. The paper problems experienced elsewhere in printing apply equally to digital printing but electrostatic problems associated with machinery can be a particular issue. To counter this, a relative of 50-55%RH is recommended. 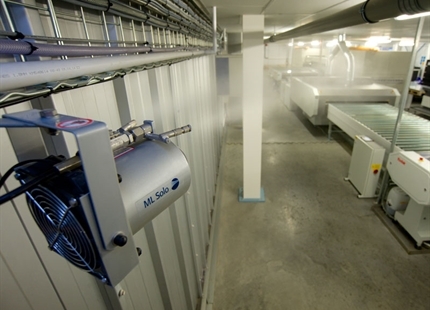 A dry press hall means the edges of unwrapped paper lose moisture rapidly. Tight edges result, making the paper curl, which causes misfeed, with misregister, dot doubling and creasing as the paper passes between blanket and impression cylinders. Misfeed also occurs due to electrostatic build up, which also causes stacking difficulties coming out of the press. Printed work awaiting another pass continues to change, with misregister being a particular problem. In dry air, work passing to finishing suffers from paper sticking and creasing due to electrostatic, and paper cracks on folds. The impacts of dry air can be so severe that printing stops altogether. Maintaining a relative humidity of 50-55%RH in the press hall and bindery resolves these issues. If air is too dry in the paper store, laydown area and reel stand, the exposed edges of the paper rolls loose moisture and shrink. On the web press, the paper is under greater tension at its edges than the centre, which causes the edges to tear, leading to web breaks. The result is substantial downtime as the paper is spliced or rethreaded through the press. In a dry press hall, the rapid passage of paper through the press generates electrostatic charge, which becomes a particular problem as the printed work passes to finishing for cutting, trimming and folding, due to sticking paper. Web printing is highly productive and any loss of production is costly, but problems relating to dry air can be addressed by maintaining the relative humidity at 50-55%RH. In flexo, with water-based inks, 55-60% is required. Click here to see some of our printing clients from around the world. Talk to an expert in print humidity control & humidification today. Click here.